A Small Piece of Paris In Houston. Planning a wedding can be fun, sometimes overwhelming, and certain tasks can be a challenge. One challenge that wedding planning brings is choosing what will be on the menu. The good and the bad news is that there are no set rules on this anymore. In the past, the standard seemed to be chicken or steak with potatoes and a side of veggies. But now, wedding goers can expect anything from build your own tacos to pizza to the finest dining you can imagine. So how do you choose? At Alegria Gardens, our wedding venue has skilled planners who can help you nail down the perfect menu for your big day. And to top it off, we have our own caterers who can’t wait to create a meal that everyone will enjoy. Before you can really get started planning a menu, you’ll need to know how many guests will be attending. 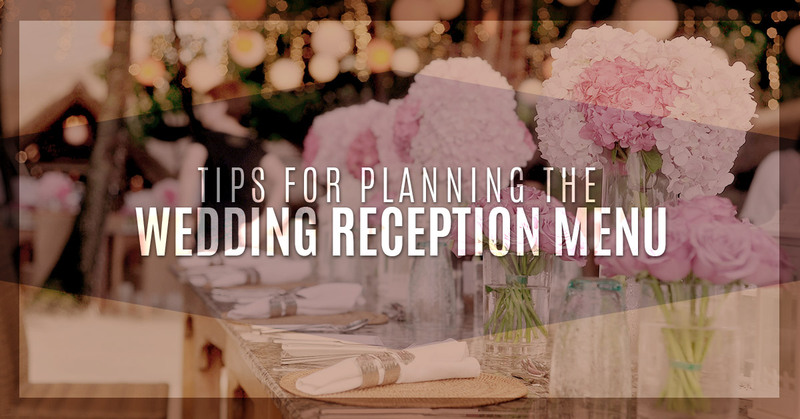 Your caterer will have suggestions on how many plates to plan for based on how many people have accepted your invite. This will help you plan a budget, which will help guide your meal planning. As always, be open and upfront with your wedding venue caterer about your budget and be specific as possible. If you say your budget is between $1,500 and $2,000, they may plan a menu that’s close to $2,000, so make sure you are comfortable with the numbers you give them. Also know that the budget should include the food, the staff, service charges, and gratuities. If you want chicken or steak with potatoes, go for it! But does that menu really show you and your significant other’s personality and style? Put some thought into what you like and want to eat on your wedding day and let your caterer know. You could find inspiration from something that you ate as a couple and loved, it could be a family favorite, or it could be the first food you make for your fiance. There are obviously a lot of foods to choose from and it can quickly become overwhelming when you’re presented with option after option. 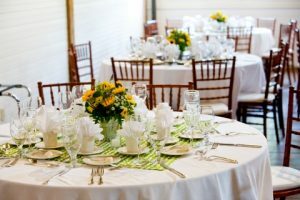 Before you schedule a meeting with a caterer, consider writing out lists of likes and dislikes, must-haves, and definitely nots. Do you want the food on the savory end? Will there be any sweet additions other than the dessert? If there will be children at the wedding, also consider creating a kid-friendly menu as well. If you know there are guests who have a gluten allergy, nut allergy, or who are vegetarians or vegans, plan on having a menu that is specific for them. Let your wedding venue caterer know well in advance so that they have time to make adjustments and prepare for separate meals. This may add to your budget, but will go a long way in making the guests feel welcome and special at your wedding. How Will You Serve It? When you have nailed down the food, think about how it will be presented. Plate Service: A common option, this allows the guests to sit and the food is brought to them. Buffet: A more casual option, but still common, the guests go to a food table to fill their plates. Stations: Can’t decide what type of food you want? Create stations and let the guests decide. Family Style: Large platters are set at the table, which are passed around. 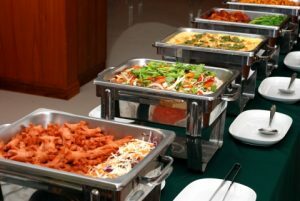 When you are having trouble deciding on a menu, keep in mind that the caterer or wedding planner will have advice and can guide you through the process. At Alegria Gardens, our staff is well versed in menu selection and what guests are sure to love. Visit our wedding venue in Katy and we’ll plan a menu that is perfect for your big day. Our entire team is highly qualified to organize diverse events like weddings, quinceaneras, graduations and ceremonies. At Alegria Gardens Reception Hall, our promise is to bring you the best service in every aspect. Contact us today!